Lazy Seamstress: Another good post day! another good post day!, originally uploaded by indiaeden. Ok, it's a bit embarrassing how much I've been treating myself lately! 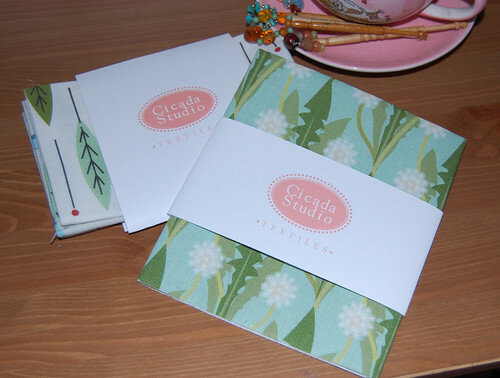 Today's post brought more lovliness,this time from Cicada studios. I fell in love with this dandelion print linen the other day,and while that dropped into my basket so did the little set of fabrics that arrived with it. I think the dandelion fabric is going to be partnered with some beautiful celery coloured silk I picked up from the remnant bin in John Lewis the other day,and become a dainty little bag for me. 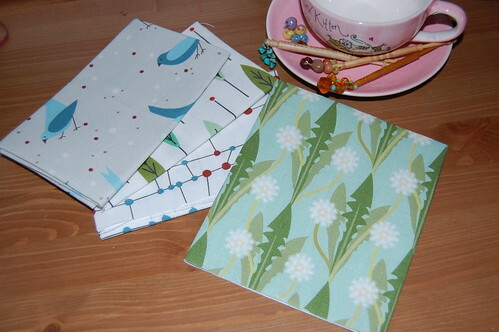 I also received two lovely notebooks in the post from Bits For Bairns. I love notebooks,and sketchbooks and have quite a collection scattered around the house.I'm a compulsive list maker so they are full of lists and doodles.